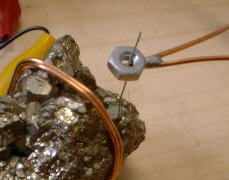 Iron Pyrites Negative Resistance Oscillator. Iron Pyrites with #30 copper wire catwhisker. Curve tracer shows negative resistance in the reverse bias portion of the curve. 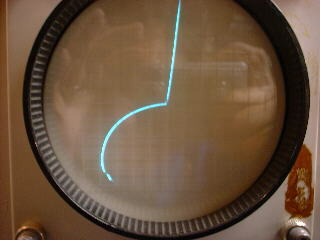 Curve tracer is set at 2v/div. horiz and 2ma/div. vert. Curve tracer was modified to apply ac to the device. Success with this experiment has been a very exciting experience for me as it represents the ability to build a simple homemade active semiconductor device. It is almost like making your own homemade transistor. This is an actual realization of some very old, and esoteric 1920's experiments, by W.H. Eccles, Greenleaf Pickard and Oleg Losev, that were so vaguely reported in a few articles that I have often wondered if in fact it had actually been done. Even so, I have always had an extreme fascination with those reports of being able to produce a continuous wave RF signal from a crude semiconductor matarial back in the very early days of radio. My fascination led me to purchase an old Tektronix 575 curve tracer so I could study the curves of iron pyrites, galena and other detector materials that we normally play around with to make crystal sets. The 575 is a vintage but great tool because it continuously shows the curve in real time as you manually manipulate the samples. This is what is needed in order to make observations while manually touching a piece of wire to a piece of rock. I wanted to be able to display both the positive and negative portions of the curves simultaneously and so had to modify the curve tracer in order to do so. Visable on the curve tracer, is a negative resistance curve that could be obtained from several different pieces of iron pyrites (with much finicky adjusting). Not all pieces of iron pyrites seem to work. I found that the kind with a lot of little crystal formations worked the best. The fact that several pieces that I happened to have, worked, makes it appear that a working crystal is not all that rare. It was nice to realize that this phenomenon was not just the result of some fluky "one in a trillion" find. Adjustment of the catwhisker is very critical however, and requires a lot of patience in comparison to adjusting as a receiving detector. For every spot that produces a useable negative resistance, there are many many settings that would make an excellent detector for reception. As the curve tracer photo above shows, the negative resistance region is in the reverse bias portion of the curve at approximately -8 volts and 8 ma. Some of the articles refer to this as being like a tunnel diode. It is true in the sense of having negative resistance, but it is in fact a different type of negative resistance. This is ok since both types of negative resistance can have the effect of gain, supplying enough energy to an LC circuit for it to become an oscillator. The negative resistance portion of the curve is obtained when negative voltage is applied to the catwhisker. Two types of negative resistance. Left is type found in iron pyrites. Right is type like a tunnel diode. I am not an expert on negative resistance but I once read an article many years ago, that described how negative resistance is in two forms. I seem to recall them being a type S and a type N (I don't even remember for sure which is which. I welcome any enlightenment on this). One type is the type found in a tunnel diode and the other type is the type found here and in other devices such as a neon lamp, unijunction transistor and what I believe to be in the old carbon arc oscillators. The figure above shows how the two types of negative resistance curves are possible. The negative resistance seen on the curve tracer is upside down with respect to that shown in the left part of the above figure so that both the positive and negative portions of the curve can be displayed. 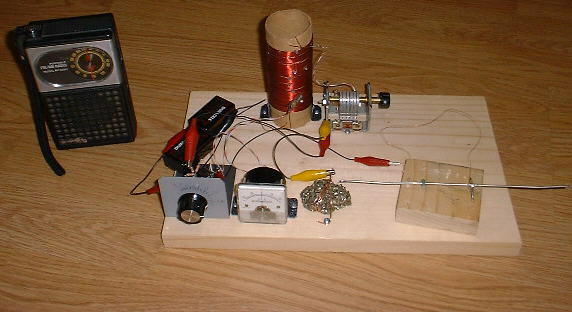 The circuit shown is all that is necessary to produce a continuous wave signal in the broadcast band. It seemed difficult to get it to operate above 2mhz but was easy to get it running at anything below that, including audio frequencies. It seems to prefer certain LC ratios better than others. 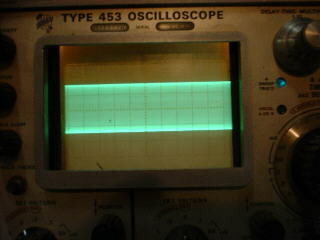 In the case of the broadcast band, A 365pf variable capacitor worked well with a 190uh coil (100 turns on a TP roller). Once a good piece of iron pyrites is selected, the curve tracer is not necessary for making circuit adjustments. A meter or oscilloscope, to indicate that the the circuit is oscillating, is the most important tool in making circuit adjustments. Broadcast band Iron Pyrites negative resistance oscillator. Carbon Mike enables am broadcast to nearby am radio. Iron Pyrites Negative Resistance Oscillator Board. Circuit can run on 18 volt supply (two nine volt batteries). Note "Tone Arm" catwhisker. When adjusting the 1k pot, I could find a range where the oscillation amplitude would vary with the voltage from the pot. This suggested the possibility of voice amplitude modulation with a carbon microphone. I was indeed able to hear my voice on a nearby radio with a carbon microphone placed in series with the battery supply. Just imagine the fun it was to be able to talk on the radio with an electrified crystal set. I found it extremely difficult to get steady oscillations with conventional type catwhiskers. I tried a simple idea that I call the "Tone Arm" catwhisker because of it's resemblance to the tone arm of a phonograph. With it I can often obtain steady oscillations that last indefinite periods of time (several minutes anyway). This catwhisker also worked very well when used with a normal crystal set. I got good results using #30 gauge copper or #28gauge steel wire for the catwhisker. Those sizes are what I happened to have handy. "Tone Arm" catwhisker close views. This closeup is an improvement over the tone arm seen in the oscillator board picture above. The idea of the Tone Arm catwhisker is to make it light and easy to move up and down, but rigid in sideways motion. This makes the catwhisker able to rest on slanted crystal facets without sliding off. The picture of the Tone Arm is self explanatory; a triangular wire frame, a weighted base (with three felt bumpers on the bottom) and hinges to allow the arm to move up and down easily. The catwhisker itself, can be any chosen piece of fine wire connected to the end of the arm, by wrapping or soldering, and pointing downward. The coil on the base is thin 30 gauge copper wire to make electrical connection to the arm without interfering with its delicate movements. A small weight can be put on the end to increase catwhisker pressure. 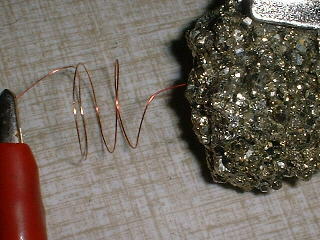 To connect to the iron pyrites, several turns of bare #18 copper wire were wrapped around it and twisted tight. I have always found this kind of arrangement to be as good as anything. It has never seemed that casting in molten metal etc. is at all necessary for any of the crystals I have ever experimented with. Another copper wire over the crystal and wrapped around a couple of screws in the board works well for mounting the crystal. The best way to get the circuit going is by setting the 1k pot to a mid point and then patiently and carefully probing with the catwhisker. Catwhisker adjustment is by far the most critical part of the process. Many points will be found where the meter will jump momentarily. These are good places to stop and try some fine adjusting, by gently nudging the wood block that supports the "tone Arm", for a steady meter indication. If nothing happens, the pot level is raised a bit and searching on the crystal continues. The ranges on the pot that work are fairly wide in relation to the complete range of the pot. This puts most of the burden of adjustment on simply searching the crystal. Use just the oscillation indicator for adjusting. Get the circuit oscillating and then tune it to a selected frequency on a nearby radio. Trying to adjust by listening to the the radio is futile because you would have to search the crystal for each of many many different tunings as well as each of many different pot settings. You can imagine how many combinations would have to be tried. 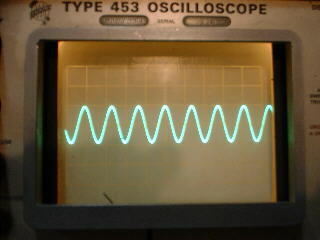 Scope picture of signal from Iron Pyrites Oscillator. A clean continuous sine wave is attainable with careful adjustment. Many adjustments however, produce a somewhat distorted sine wave. Frequency shown is approx 700 khz. Do not sell your expensive radio just yet. This circuit is far from being a replacement. It is extremely finicky to adjust and is not great for staying in adjustment. However, I can usually find a setting where the circuit can be run for a number of minutes while I walk away and do something else. The biggest feature this circuit has to offer is the thrill of watching it run. See also Zinc negative resistance device. Zinc Negative Resistance. See also homemade Tunnel Diode N type device. 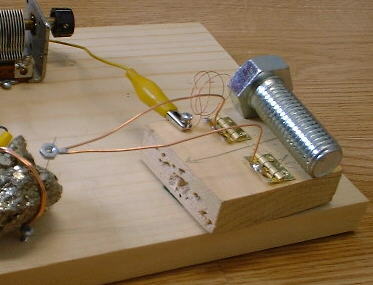 Homemade Tunnel Diode and RF Oscillator.